July was a month that [mostly] did not disappoint. There were some moments this past month that weren’t what I was hoping they would be. And there is almost always something I wish I’d done better or been better prepared for. But, some things just happen and you have to roll with it. But, overall, July was a really great month. My training for the South Padre Island Marathon technically started in July, also. Shall we review? • run at least 90 miles (B goal of at least 80) – SUCCESS! Ragingly so! I ran 112 miles!!! • hit my goal weight of 160 and then switch to working toward a new goal of hitting 23% body fat (per my FitBit Aria smart scale estimate) –SUCCESS! Omg, so much a success! I hit my goal weight on the 7th! I was at or below my goal weight all month…well, until I had TTOTM/TOM last week, I stayed there. But I only went over my goal weight on the next to last day of that and immediately started dropping the weight (since it was just bloat and water retention) the very next day and was back below my goal weight. • continue to strength train at least twice a week, doing 3 upper & 3 lower body exercises or 2-4 core exercises – MOSTLY A SUCCESS. The 3rd week of July, while I made it to the gym 3 times, I only did strength training on one of those days. Wah wah. But the rest of the month, I got my 3 per week done. • continue to hit the treadmill for tempo runs and maybe do a workout or two from the book – SUCCESS! I ran on the tready (my new favorite nickname for it!) quite a few times actually. But, no workouts from the book. • do some runs after work –SUCCESS! I actually did at least 3 night time runs! • continue to limit “treat” foods and track everything I put in my body –SUCCESS! Some might call me a little obsessive about tracking, but I still track everything, down to just one sugar free candy that’s only like 10 calories. I’m serious, if it goes in my mouth, I track it! I did allow myself the smallest slice of pizza in the box at work one night, but only because I had gone for a run and had a really good strength training session and over 20,000 steps for the day. And I tracked it and did not feel any guilt. • hit 10K+ steps a day – SUCCESS! In fact, most days, I had over 15K! And, I decided to up my daily step goal to match that and now work toward hitting 15K a day! • cycle and swim at least twice each –HALF SUCCESS. I definitely got the swimming in, but I was so much about the run this month that the cycling just didn’t enter the picture at all. 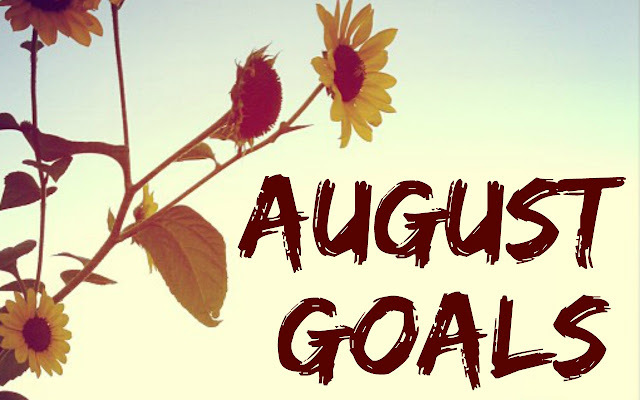 And now let’s move onto my goals for August! And now, I thought I’d try something new this month. Feel free to let me know what you think of this addition. One of the blogs I read posts recaps of different “subjects” of what is going on in her life. Kinda like a breakdown of things under categories. So I thought I’d give it a try and maybe do these kinds of posts once a month (add them to my monthly goal recaps) since my life isn’t SUPER exciting and I don’t really get out for much other than running, the gym and working crazy hours at work, so once a month is probably more than enough. So here we go! Traveling: I went down to San Antonio to run the Free-da Run 5K on the 23rd. It supports the University of the Incarnate Word’s art department. So definitely a worthwhile cause and I love art and the wonder of self-expression, so I was all for this. Plus, I got to doodle a unibrow and wear a crown of fake red roses! Also, on the 28th, I went to New Braunfels with a bunch of friends and hit up Schlitterbahn, which is a water park that uses naturally flowing water for all of its attractions. Running: definitely did lots of this. My favorite run this month was probably my 8.4 mile night run last night. My least favorite run was the 9 mile slog I did last Monday. My proudest running moment this month was actually when I tallied up my miles and discovered I’d run 112 miles…sure a bunch of the miles were done on the treadmill, but that is just a very handy tool to help us runners reach our goals during hot and inclement weather conditions1. Another proud running moment for me was when I ran 2 miles just running back and forth in a truck stop parking lot. My longest run this month was 13.1 miles. the run I did that was the most fun was definitely the Free-da Run 5k. Reading: I’ve been doing my best to reread Elfstones of Shannara in my car before work each day…I am trying to see what the differences between the book and the MTV television series are, so far the differences aren’t THAT big of a deal, except where the Elcrys is concerned…I don’t really like the adaptations they made regarding that. And I started reading Choose to Lose by Chris Powell. I’m wanting to do carb cycling for a couple months to help me finish hitting my goals with weight and body fat % and I know carb cycling comes highly recommended for both of those things. Eating: I’ve been doing really, really well with this. I haven’t been eating more than my body needs and I’ve been a food/calorie tracking rockstar! I do allow splurges and “off plan” foods, but, I track everything that goes into my mouth and I don’t go over my allotted calories for the day. I try to keep my overall intake under 1500, even on extravagant days and also even with exercise. But it doesn’t always happen and so long as my remaining calories are still in the green, it’s a good day, so long as I don’t have too many that are a close call, you know? I really like to have a deficit of at least 500 every day. I ate probably the healthiest thing on the Taco Cabana menu in July. The beef street tacos with a tiny bit of salsa ranch. They’re so good and only like 320 calories for 3 tacos. Not bad at all. I will definitely get them in the future if I want fast food, but not crap. In July, I ate, for the first time, protein pancakes! I really liked them, but my first effort was a little dry, even with sugar free syrup poured over them, so I vowed to use a little applesauce in the next batch of that same recipe to moisten them up a little bit. Also, the protein powder I used with that first batch was some cheap stuff and gave me horrible gas. So, I went and bought a better quality protein powder for my subsequent batches. Planning: right now, I’ve registered for the majority of my fall and early winter races (and even some races all the way into May of next year!!! ), so I’m just laying down and cementing my plans for any necessary travel to and from said races. I also like to plan my weekends a week or two in advance as far as projects I want to get done. I’m doing a lot of planning with my scrap journal since I’m still getting that all up and running. And I’ve still got some work on my costumes to keep me busy. And I bought a new vacuum, so I’m making plans to vacuum at least once a week. Exciting, I know. I’m also planning on beginning to follow the “carb cycling” method of eating for 1-3 months in order to help me hit my body fat % goal. Wearing: INKnBURN! I seriously love this company and I love being one of their ambassadors. I will sing their praises all day, every day. I mean, they’re not the only brand I wear, but they’re the only brand I’m will to spend MONEY on, if you know what I mean. Everything else, if it’s not discounted or at a discount store or on clearance, I’m probably not going to buy it. I still have an obsession with running skirts. I heart them. Especially now that my legs are starting to lean out…they’re looking down right banging in a skirt that stops just above mid-thigh! I recently signed up for a Fabletics VIP membership as well and have bought a few of their pieces, but they’re still a smidge pricey and, like I said, I only like to spend MONEY on my INKnBURN, so I don’t buy a whole lot from Fabletics. Working: as much overtime as I possibly can/am allowed to. That means a lot of 56 and 64 hour work weeks. But, I had this last week of July off from work and have next week off as well. Getting lots of fun stuff done. And there was one day where I was awake for about 27 hours and then promptly only got 2 hours of sleep thanks to my brain deciding it didn’t want to shut off and my anxiety rearing its rather fugly head over where I had parked my car when I got home from work that day because some jerkface parked halfway into my parking spot. Loving: still in love with my new medication. It has made my life 1000 times better, easier, more fun, less stressful, you name it. Everything is just way better. Also, my abs…my whole torso in general, actually. My torso is really slimming down and you can actually see the shadows of the muscles hidden underneath! I mean, I’ll never have a visible 6-pack and I’m totally 100% okay with that. But I’d love to just have that slight bit of visible definition and the v-cut above the hip bones. And no lumpy upper hip area. But that’s almost gone, so not really an issue anymore. How I look. Seriously. Every time I take a new selfie, I’m like, wait, that’s how I look? Like seriously? I’m a skinny Minnie and dang look at those muscles! Sure I’ve got loose skin on my stomach, but the rest of my body looks fantastic! And my new, much smaller work uniforms are getting to be way big on me. I’ll wait a year before asking to trade them in for even smaller uniforms. I’d like to maintain my weight loss for a little bit before I commit to even smaller uniforms! I’m also super loving this shopping app called Wish. This thing is super addictive as everything is super cheap. I limit myself to like $40 a paycheck to spend on there. And for that $40 I get SO. MUCH. STUFF. Looking forward to: all the races I have coming up between now and the end of the year! I’m participating in the Austin Runner’s Club’s Distance Challenge. It encompasses 5 races between September and mid-February. The distances are anywhere from an 8K all the way up to a marathon. So I’m big time looking forward to completing this challenge! And running new-to-me races. But, for this month, I’m looking forward to the 2 half marathons I have scheduled. Next Saturday, I have the Night Moves half. It’s a trail race. So I’m pretty excited about it. I love running trails! The other is the Dragon’s Den half down in San Antonio. It starts at 6:30 and it’s smack in the middle of August in south-central Texas. Boom. Don’t be surprised if I suddenly burst into flames while running it. HA! I’m also looking forward to running the Dragon’s Den with a couple of friends. Well, not WITH them, with them. One will most likely be way faster than me and the other is slower than me. But we’ll meet up pre-race and probably post-race as well. Things I did well: tracked my food, stuck within my calories, and didn’t overeat – stopped eating when I felt satisfied or at the beginning of the inklings of feeling full. I also did really well with posting multiple blogs each week which makes me a happy blogger and hopefully makes you a happy reader of my blog. I was also super fantastic about being grateful and appreciative when people gave me compliments or congratulated me on my progress with weight loss and fitness. Things I can improve: planning my workouts and sleep schedule a little better so that I can be more efficient at both. I noticed a smidge of my food obsession creeping back in on me. So I really need to work on that. It’s mostly happening on the days when I work a double shift at work, so I’m trying to space my meals out a little more so I don’t get ravenous halfway through my late night shift. But, since I’m sooooo very used to eating at basically set times (11am-ish for breakfast, 3pm for lunch, 4:30pm for snack, and 6pm for dinner) that even though I’m not hungry at said times, I start obsessing over eating and watching the clock like a hawk. This got so bad one day I taped a piece of paper over the clock on the bottom right corner of my computer screen so I wouldn’t see what time it was! It just really annoys me that I start semi-freaking out at my usual eating times, because I’m not even hungry. Guess I need to figure out a way to make sure I’m sufficiently distracted on double shift days.